The other day I was listening to a podcast about a small Ecommerce business. The site is called Satin Lined Caps. They sell a niche product that appears to solve a niche problem . Without going into the details, I will say that its a tough sale. Its a tough sale because you have to explain and show the product. People aren’t necessarily looking for this product but certainly enjoy it. 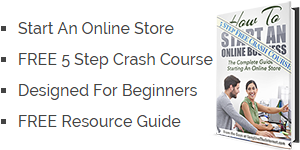 We talk a lot about picking a niche when starting your own Ecommerce store. Having a focused niche gives you a better chance of being found. It also gives you the ability to focus on your targeted customer. With a smaller target, you can fine tune how you reach your customers. In the case of this store though, they need to show the product. Seeing a picture of the product isn’t going to make the sale. Display banner ads are probably a miss as well. They have a specific demographic with a particular problem. The owner understands this and realizes that he needs to reach his customers creatively. He needs endorsements and he needs to educate his potential customers. He mentioned the success that he was having with YouTube. He mumbled under his breath that he was using a service called FameBit. At first I heard FameBid but a couple searches corrected it. I hadn’t heard of FameBit at the time. I’m always keeping my eyes and ears open for new Ecommerce marketing ideas. What most people don’t realize is the size of YouTube and the traffic they receive. A little company by the name of Google acquired YouTube back in 2006. At the time they paid an eye popping $1.65 Billion in Google stock. YouTube was one of the fastest growing sites online. Fast forward to today. They are the number 2 trafficked site online. They sit behind Google.com themselves and flip flop back and forth with Facebook. YouTube currently has more than 1 Billions users. People are watching hundreds of millions of hours of video on YouTube daily. Every minute 300 hours of video are uploaded to YouTube. It’s exploding. Its no shocker that there is an opportunity for Ecommerce marketing here. I know the size of YouTube but never knew what to do with it. Its so enormous I felt a little overwhelmed. I have to be honest, I’m not a video guy. I don’t like public speaking and I almost cringe at the idea of filming myself. Bob and I have known for a while now that we don’t have an option though. People are moving towards video and they are doing it quickly. Like my daughter preferring a book read to her, people prefer watching video. Rather than reading a story, they rather be read a story. I’m having trouble dealing with this because I’m not comfortable with video. You know the feeling you get when you hear your voice being played back for the first time? You question who in the world it is. Do I really sound like that? Anyhow, people are changing and their preferences are changing. In all the successful online businesses we have built, we never had to make videos. In this dog eat dog world, you either change or get left behind. Eat or be eaten. 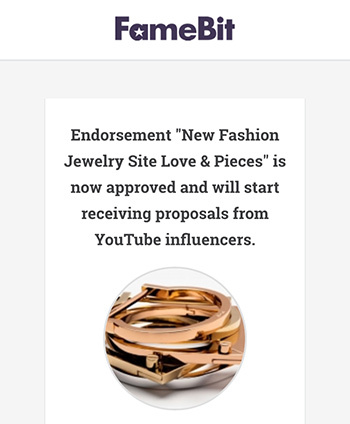 FameBit is a platform that allows brands and YouTube stars to connect with one another. What does that mean? Sounds like marketing talk. Lets look at it closer. There are thousands of pseudo celebrities on YouTube that have loyal followers. As you know there are videos about anything on YouTube. Some people generate and publish videos on a regular basis. These videos are often published weekly or even daily. Other people follow these YouTubers and religiously watch their videos. Whether these videos are cooking lessons or new tech product reviews, they get views. People are on YouTube and they are soaking up videos. These YouTube celebrities often have thousands and thousands of followers. Some personalities have over a million subscribers. People subscribe to their channels. They are notified when a new video is released. Some of these videos can receive over 250k views. These are real numbers and numbers that can’t be ignored. 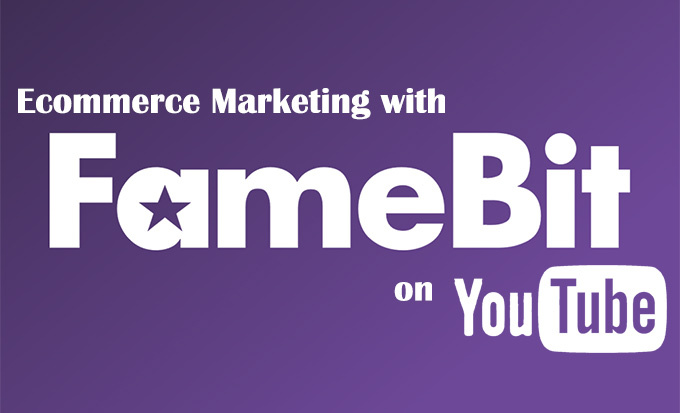 FameBit puts small and medium size brands in touch with these YouTube personalities. This sounded perfect for me. I could stay out of the limelight and see what the real stars can do. After signing up for a brand account, I was taken directly into my FameBit Dashboard. A simple “How It Works” explanation awaits you. Enter your request for a video by sharing information about your brand. 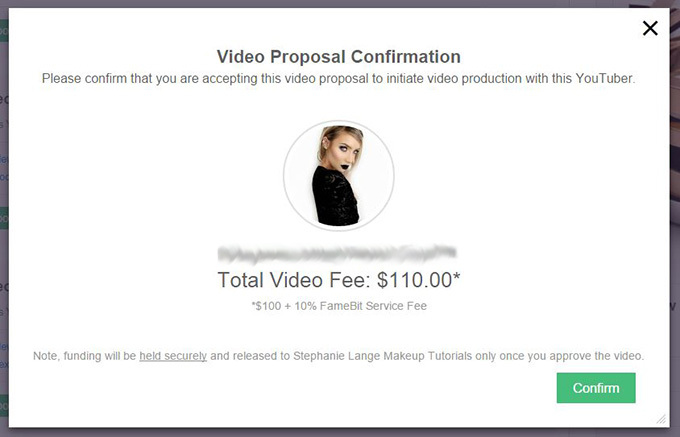 Receive proposals from YouTube stars. Let them market your Ecommerce site or product through a video. Seemed simple enough. 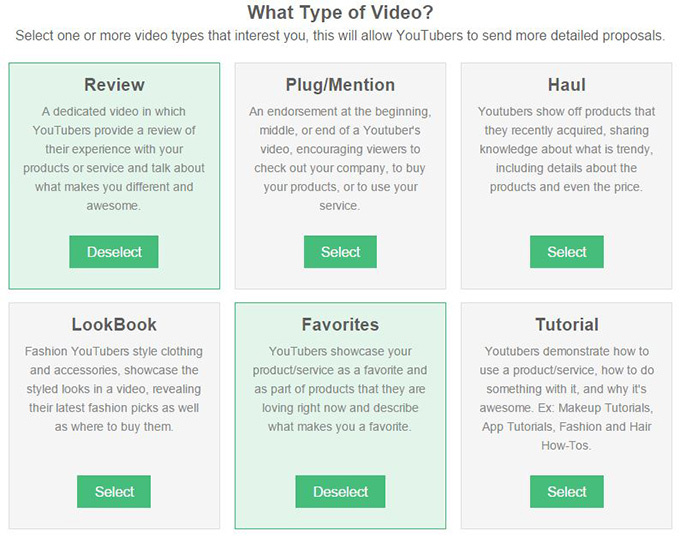 The first step of the process asks you to select the type or types of video you are looking for. In my case I was going to create a request for my wifes Ecommerce site. She sells fashion jewelry online. In her case she isn’t an actual jewelry designer. She offers many different designers but didn’t want to showcase any particular one. What she did want was an endorsement of her site or her brand. I selected Review and Favorites. After selecting the video type, you enter some information about your companies brand. You can give a brief pitch and upload a photo. 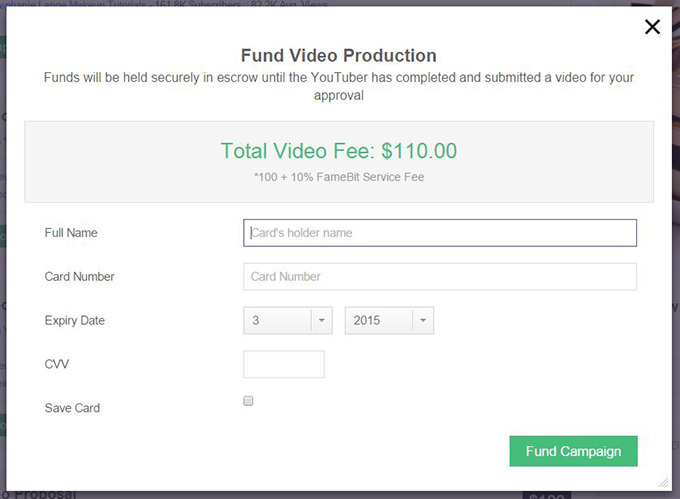 You also select the budget you have per video. In my wifes case she doesn’t want to break the bank so I selected the $100-$250 range. We wanted to see how this works. If it works, we can always scale up. I imagine we can reduce the cost per view with larger YouTubers. One of the things to consider is your age demographic. YouTube skews younger in general. 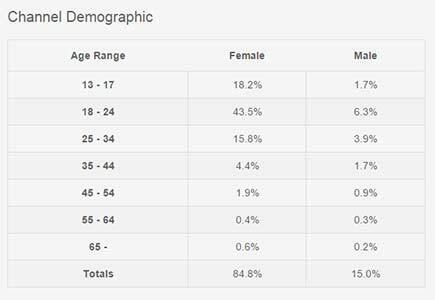 While browsing most of the YouTubers, FameBit does a great job of breaking down the age demographics. You will see that the majority of YouTubers will be under 24. This is largely because of the medium. Younger people are more comfortable watching videos on YouTube. This is either on their phone, tablet, computer, game system or various other platforms. In my wifes case she sells fashion jewelry. Her price price point ranges from $40 to about $300. Her target demographic are woman with disposable income to spend on themselves. Because of her price point this is mostly women over 21 years old. I made sure to reference this in the pitch. Also noteworthy is the fact that my wife is looking for a review of her site or brand. I was forced to upload a picture of a product. In her case she doesn’t have a conventional product. She offers a service that doesn’t have a picture. I uploaded a logo to bypass this step. Once submitted I got the message that my submission was Pending Approval. We should be hearing back from them with-in 48 hours. As we wait for her approval, I’m not convinced YouTube is going to work for her. My wifes Ecommerce site is different than a specific product. Unlike a particular product, she offers more of a generalized service. She sells various, different brands. Unfortunately this means she’s not in a position to send free products to YouTubers. There isn’t much to show. The nature of YouTube is showing. With her site, I’m not sure we are going to be able to communicate her value proposition. I’m hoping that I’m wrong and regardless this is something we must pursue. YouTube is too big. The push towards Ecommerce marketing through video is too large to ignore. I’m looking forward to hearing back from FameBit and I will return to keep you updated. Well that wasn’t long. As soon as I finished writing the above summary, I received an approval email. I would say it was an hour. It looks like they also changed my logo image out for a random screenshot from the website. I don’t think the image crucial element of the campaign. It’s more to garner attention from YouTubers. Its a pitch really to attract YouTubers to submit proposals. Also noteworthy is the image appears to be square dimensions. It appears throughout the campaign in this format. It doesn’t mention this when you are uploading the image but you want to upload a square image. 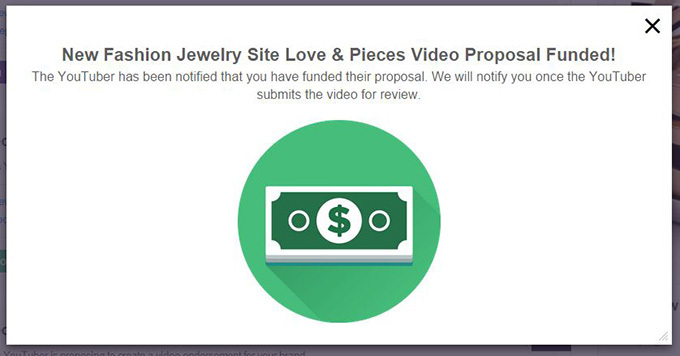 Within seconds of the approval email I had received a dozen proposals from YouTubers. I haven’t had a chance to go through them yet and will take a look shortly. The time-frame that they came in made me wonder if they were automated. Either they met certain criteria and were auto-submitted or they actually have that many people. I will give them the benefit of the doubt and will be back after I have had a chance to review the proposals. And I’m Back…. Whoa! Its been less than 24 hours and shame on me for even thinking there was some type of automated pitch submissions. To say that we have been bombarded is an understatement. We have received over 50 proposals in under 24 hours. There are YouTubers coming out the windows. I knew pretty quickly that we had to get organized or this would be a shot in the dark. I didn’t want to go through all this to be so overwhelmed that we gave up. With so many offers and proposals so quickly, I needed a way to organize them. Each proposal comes in as an email and there was no way to keep track of what was what in your inbox. I decided that I needed to create a spreadsheet to organize them. Famebit provides some basic statistics that are crucial to comparing your proposals. I Took each proposal and entered them line by line. I created different columns based on what I wanted to compare. Let me show you my data and elaborate further. I have hidden the YouTubers names to protect their privacy. The three straight forward statistics are the YouTube Channel Subscribers, Average Views, and Cost. I entered all these fields first. Once I had these, I wanted to be able to compare apples to apples. I added a column called CPM. CPM stands for cost per thousand views. This term is generally used with banner advertising. If you have preconceived notions about specific CPM rates, toss them out the window. Its important to note that the value of a view on a YouTube video is much greater than that of a banner ad. The viewer is engaged with the video and watching the video about you. Additionally they are watching it from someone they trust. These are YouTubers that they follow on a regular basis. When you take the endorsement factor and combine it with the video content, there is no comparison. Its also important to note that I first tried doing a pure cost per view calculation. The numbers were so small that it was meaningless. This is good though. That means you are paying fractions of a cent per viewer. To have the values make sense though, I had to multiply it by 1000. Here is the exact equation I used in excel if you are wondering. After I had the CPM I also wanted to see how engaged the viewers were. This is not a full proof statistic because there are other potential outside factors. All that aside, I decided I would look at the percentage of Avg Views compared to subscribers. My theory is that the higher the percentage, the more involved the followers are. The more involved they are, the more they trust an endorsement. Here was that equation in excel. Lastly I went through each of their profiles and marked whether I felt they were a good match. This was based on a couple of factors. Did I feel of the videos and the style of the videos were a good match for the brand. Were the age breakdowns appropriate for our demographics. Was their country views primarily the US. There were many YouTubers with great stats but primary markets in other countries. The average number of views that I saw when looking at their videos. Its important to look the view count on each individual video. The average views provided by FameBit often includes 1 or 2 slam dunk videos that the YouTuber has had. Many YouTubers have 1 or 2 videos that were wildly successful. These videos may have hundreds of thousands of views. This skews the numbers. When you look yourself, you may see that most of their videos actually are getting 10k views. Make sure you are looking at this. You may even consider replacing your average view number in the spreadsheet. This way you can make sure you are comparing apples to apples. Once I assessed those four variables I simply marked a Y or N for whether I thought it was a match. I now had all the data in a spreadsheet where I could compare it. I sorted the data by descending CPM. This was going to display the data with the cheapest cost per 1000 views at the top. I could now go through and ignore the N matches. I could also focus on the engagement level of the ones that interested me. I have isolated the list down to four YouTubers that I think make for good Ecommerce Marketers. 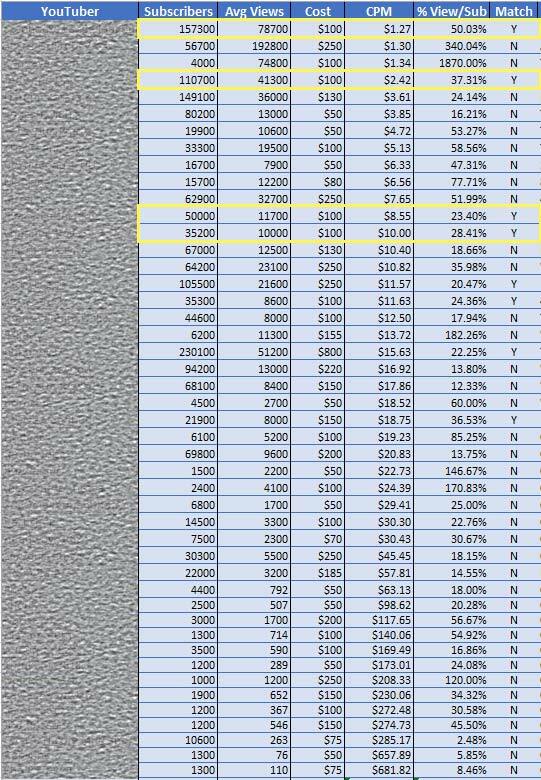 They are outlined in yellow in my data above. I have yet to reach out to any of them yet. I need to first go over this with my wife to discuss before we approach them. I also haven’t closed the campaign yet. I want to see if we get any good submissions still. They are still coming in but most of them are too costly a CPM. I’m a numbers guy and believe strongly that numbers tell the story. Some people are less concerned with the numbers and more with the personalities. It’s important to note that the majority of the proposals I received appeared to be caned responses. I would be surprised if 5% of the applicants actually read the information that I wrote. Most of these YouTube marketers are just blankly applying. They figure if they catch one they can review the company at that time. I specifically said that we would be featuring the brand but not sending product. Most of the proposals were talking about looking forward to wearing jewelry in the video. Given the number of responses I received, I think I would change something in the future. When running a future FameBit campaign I would do something that I do when we post for job applicants. 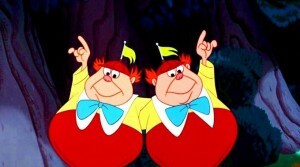 Bob and I always ask at the end of the job description to send your favorite Disney character. This should be sent along with your resume and cover letter. It’s not that we love Disney so much, but this simple sentence weeds out the crowd. If you aren’t taking the time to read our description and you can’t follow directions, you’re not our candidate. I would do this in a future FameBit campaign to try and weed out YouTubers who are not serious. Besides blind proposals, I’m not sure much thought goes into most peoples pricing. It seems a little wild west based on the discrepancies I’m seeing. The good news is that everything is negotiable. People present their prices but that’s what they are asking. As with everything in life don’t be afraid to negotiate. I intend to ask for a slight reduction to each of the people that I reach out to. Some of the proposals even mentioned they were negotiable up front. If you don’t ask, you won’t get. So its been about a week since we received the proposals and I sat with my wife to discuss them further. My wife is still having trouble understanding YouTube marketing. I understand her caution. Its crazy to think that hundreds of thousands of people religiously follow YouTubers online. They watch their videos and relate with them from all over the world. While its one thing to explain to her, the numbers did most of the talking. We decided to reach out to the two top matching candidates from my list. Between the two of them they had 270,000 subscribers with and average of 120,000 views. Even when going to their pages and looking at the average counts myself, it looks like 50,000 average views total. Each of them had $100 bids and the numbers were head and shoulders above the others. We decided we would reach out to them to clarify further. While both of their proposals were straight forward, I think its important to clarify. Whether you are hiring someone on Elance or here on FameBit, lock down the details. Its better to break it down up-front than assume something and be upset. So I requested changes. I thanked them for their interest and let them know that we had received over 50 proposals. I let them know that they were one of the few that we had selected but wanted to clarify some things before moving forward. My wife and I had discussed the videos beforehand and decided we wanted to provide some jewelry pieces to the YouTubers. Although it wasn’t in the budget, it just didn’t make sense for them to do a video without it. We thought they needed something to show. Its video after all. They both were willing to feature the site and mention it without jewelry but we decided it was silly. So we were able to deliver some good news along with our requests. We told them both that we would be sending them jewelry but wanted to confirm some things. Both of the YouTubers that we reached out to had a lot of Instagram followers. 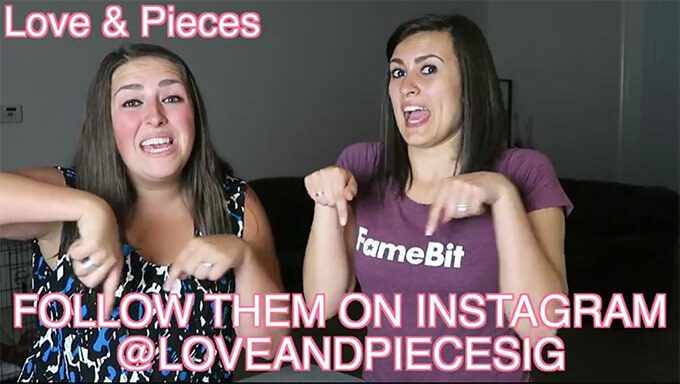 They each had about 25,000 instagram followers. Instagram is a big part of my wifes social advertising. We asked each of them for two separate posts on Instagram besides their videos. We confirmed that they would tag her in the posts. 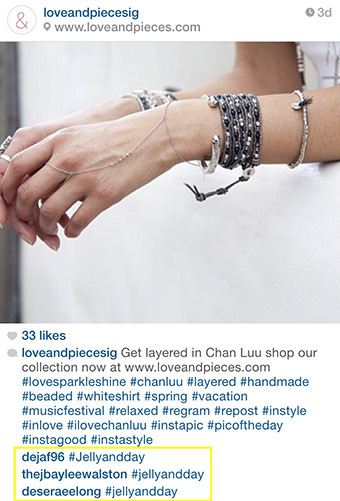 @loveandpiecesig. We also wanted to clarify that a link to her website would appear as the first link in the YouTube description. We also wanted her site to be the first featured item in the video. We mentioned that we would be willing to wait. If someone had already secured that spot we would wait until their next months featured YouTube video. If someone only ends up watching a part of the YouTube video, we want to make sure its the part about my wifes site. Lastly we agreed to extend a coupon code to them. This way we would be able to track direct sales as a result of the videos. My wife would provide a coupon code in the amount of 15% which exceeds the standard email subscriber discount. Lastly we reconfirmed the price we would be paying and thanked them for their interest. 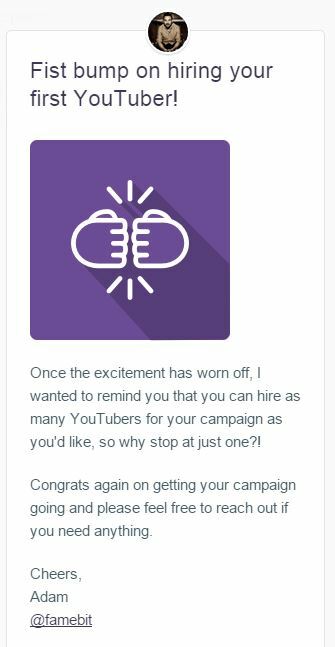 Within 24 hours we heard back from one of the two YouTubers we selected. She was excited to work with us and we agreed upon the terms. As soon as we clicked on Accept terms, we were greeted with a confirmation window. This was the first time though we were made aware of a FameBit fee. Maybe I had missed the small print somewhere along the line. I don’t recall seeing it anywhere and was thrown off. I don’t have a problem with FameBit charging a fee at all. I understand they are a business. I suppose I had just assumed it would come out of the providers side like it does on Elance or any other job site. So after I ate the fee, I confirmed our agreement. The next step took me straight to a funding window. This was another surprise to me. Up to this point I hadn’t been made aware that my payment is actually made to FameBit and escrowed. This was cool to see and a welcome level of protection for me but also one that I thought was poorly mentioned. The added protection of having an escrow service to ensure the video is deliver to you liking is great. I should have none about that. Disclaimer: I can’t say that I had combed through the site in detail to see FAQ’s or anything like that. These facts may be somewhere on the site and I just missed them. I’m merely mentioning them because I missed them and you should be aware. Anyhow, I popped in the billing information and paid. Great success. We are on our way to getting our first sponsored YouTube video. I was about to reach out to support who seemed ready, willing, and able. So a couple of days had passed an I had only heard back from the first YouTuber and not the other. I logged into FameBit to poke around and see if I could find what was happening. I went into my campaign and search the name of the YouTuber to pull up their proposal. Nothing came up. Hmm. That’s strange. I’m sure I had the name right. I went back to my trusty spreadsheet and checked the name again. I had it correct. I searched it again and nothing. I thought this was a bit strange. I decided I was going to search for them on the main part of the site and see what happened with the proposal. I couldn’t.. I was cooked. I clicked on YouTubers on the left of the page and was hoping to see a search box at the top of the screen. It wasn’t there. I had no way to track down these YouTubers unless I went directly to YouTube. I didn’t want to go around FameBit and liked the idea of the escrow capabilities but if I had to I was prepared to reach out to them. I started going through the featured YouTubers to see if I could find them. Sure enough they were there. I clicked on their account and there was no record of their proposal. There was no record of my counter proposal. I was never notified that they canceled or declined the proposal. I actually had no idea what had happened. I thought the way it went down was a little underwhelming. I reached out to them again and asked them what had happened. I wanted to see if they were still interested and that we wanted to work with them and would appreciate their response. I opened up our FameBit campaign again and asked them to apply. In a couple of hours they had responded. They submitted a proposal but never directly answered the question. I’m sure I was a nuisance with my requests. I asked for too much. If you don’t ask though, you don’t get. So they sent their proposal but there was a problem. They had more than doubled their price. I suspected they had decided they could get more money. I reached out to them to tell them how much we loved them and their demographic and videos. I asked if they would honor the original pricing and told them we were a small company with a small budget. I reiterated we would be sending them jewelry. They agreed. Great success. So now the second YouTuber is funded and we are getting them the product to include in the video. The lesson here is you want to make sure you have your records and are organized. I had their contact info and their original agreement and was able to use it to lure them back in. FameBit probably should do a better job relaying cancelled or withdrawn proposals. Either way I was able to resuscitate it. As I thought more about the videos, I was concerned we had no immediate call to action. If our Ecommerce site was going to be lumped in with a bunch of others, how were we going to stand out. I spoke with my wife and we decided we needed a call to action in the video. Besides offering a promotional code, we needed more. My wife decided to host a $30 giveaway from each YouTuber. In order to enter the contest they would have to follow her Instagram account and to tag any image of hers with the YouTubers name. This would do a couple of things. 3. Provide a clear way to see how effective the campaign was. This last minute idea I think was more a of a Hail Mary. If we can clearly get people to follow her account, she has a better chance of converting them to customers. I received an email from one of the YouTubers advising me that the video was ready for review. In the email was a link to the video within FameBits system. The whole layout was simple and straightforward. Underneath the video were three options. Approve, Reject or Request a Change. I’m not sure what would have happened if I ate the red pill but the video was perfect. It was in line with what we were looking for. Unfortunately because we weren’t the big spenders, we were pushed to the end of the video. We couldn’t justify the expense that I was told some of the other advertisers were paying. Being at the end, we run the risk of viewer abandonment. In a nutshell, a certain percentage of these viewers aren’t going to make it to our section. I’m ok with this. As a plus, it appears that their average views per video has increased. This has happened in the time that we have been working with them. It’s probably why they were looking to increase their sponsorship price. These additional views will hopefully negate any loss from viewing fatigue. So after watching the video that was completed, I marked it as approved. Instantly we were advised that the funds were released to the YouTuber. I was surprised that approving it automatically released the funds. I was going to release them next, but the message wasn’t clear that the funds would be instantly released. Either way, we were good to go, and the video was scheduled to go live later in the week. Some Instagram hash tagging action. So the first video went live just over 24 hours ago and the results have been meh. The video has had over 20k views already which is impressive. Clearly they bring the people. There are over 113 comments on the video with a number of them referencing my wifes store. My wife has had 35 new instagram followers but no direct purchases using the promo code yet. Its early still but I’m not sure its driving site traffic as wished. Google analytics isn’t showing any referrals from the video link. Her traffic was slightly higher than normal on the day it was released. Unfortunately the video happened to be released a day before my wife published an April Fools day post. The post is about teeth jewelry if you’re interested and kind of funny. The post was picked up and shared a lot on other sites. It ended up increasing her traffic threefold from normal so its tough to attribute what’s what. The YouTubers did a great job and did their part. The experience using FameBit was seamless and a pleasure. Whether these particular YouTubers were a match for the brand and the demographic is yet to be seen. Regardless, FameBit proved incredibly useful for finding, researching, and working with YouTubers. Its another viable avenue to promote an Ecommerce site. If we missed the mark on the demographic or on converting them, thats on us. If you are interested in the video you can see it below. My wifes part starts at 9:09 if you prefer to skip ahead. I will be back with an update once we get the second video completed to give a follow up on this video and a breakdown of the new one. So as I was releasing this post into the wild for the first time, I actually received an email from FameBit. They just released their new dashboard. It sounds like they have been working some time on this and it shows. I was interested and logged in to find some of my grievances resolved. I had mentioned previously that we almost lost a YouTuber but had no idea what happened to them. Turns out they had declined our counter proposal. In the new dashboard, this is clear and makes it much easier to understand. FameBit has also clearly grouped the different statuses to make them easier to find. Overall the additional information on the dashboard is great. They have added much needed navigation without cluttering the UI. Kudos to the designers. 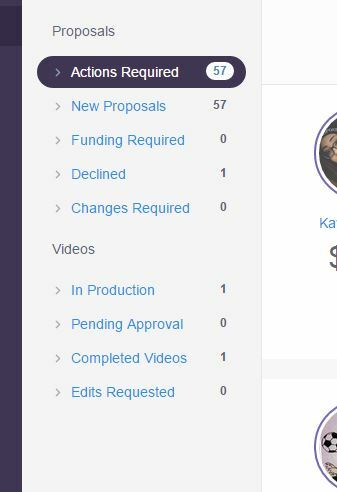 I’m still waiting on the other YouTuber but had to post an update given the new dashboard they have rolled out. The second YouTuber was actually based out of New Zealand so it took a while for our jewelry to make it to her safely. Once she received it she was able to put together a video rather quickly. At about 6PM last Thursday I got a notice on my phone that the 2nd FameBit video was ready for review. Hooray. My wife had high hopes for this one. The first video was a bit of a dud but again that may have been our fault. We clicked through to the site to review the video and take a look. In short the video was amazing. The YouTuber we worked with spent a considerable amount of time showing the product and talking about the site. My wifes site was first and foremost and the only featured brand on the video. If we had to pick a negative it would be that the video theme was about doing makeup for prom. Given my wifes price point, this is generally a little to young of a demographic. Its something we hadn’t even thought about. So the video went live about a week ago and has absolutely exploded. Based on numbers and our spreadsheet we were expecting about 40k views over the life of the video. In just over a week she has had over 39k views. My wife has sold out of the particular product twice and has just re-ordered the bracelet again. She has picked up 200 instagram followers and traffic continues to come to the site. Suffice it to say this was a 100% turnaround from the first video. The viewers were engaged and interested. Clearly the results were worth it and the success of this YouTuber more than made up for the shortfall of the other. If you are interested in the video its below for your entertainment. In closing the whole FameBit experience was a pleasure. The platform was smooth and intuitive. The YouTubers are there and ready to work with you. My recommendations after doing this are below. 1. Take the time to review the YouTuber and their engagement levels. 2. Shop around. Some people are getting a lot more than others to generate their videos but it doesn’t mean they are better. 3. Its best to be one sponsor or one featured product in a video about something unrelated to other products. Being thrown into a video of a dozen selected brands is not worth your time. You get watered down. 4. Make sure you have product in the video. A mention is only a mention. YouTube is visual and you have to commit to having something visual. 5. Include a hook to get them to your site. A promo code, promotion, or something to drive them back to your site. 6. Get a link in the description of the video. People are lazy. A click is easier than typing your domain. If its not there, they may not even come. 7. Be patient and try more than one. Some audiences are receptive while others aren’t. You have to find your match. 8. If you want things mentioned or said in the video, make sure to spell them out. Its much easier to provide the information up front then requesting a video change. 9. Go for it. Its not a major expense. Try it, you just may like it.